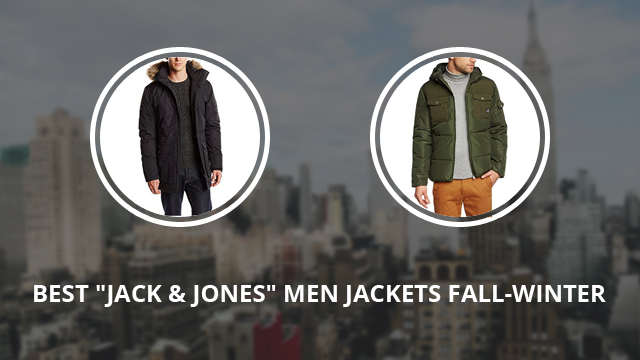 In this article we review some of the best “Jack and Jones” jackets for men to wear this fall / winter. Below you will find different parkas and jackets, in various colors and styles from which you can choose what you like most. 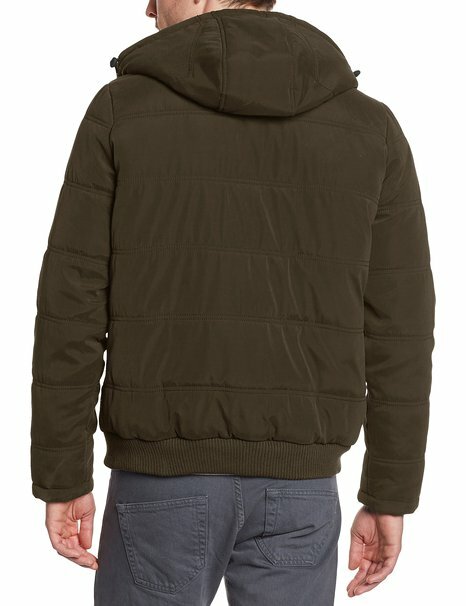 Once again the brand Jack and Jones did not disappoint our expectations: beautiful models of jackets at an affordable price. Take a look at this wonderful collection and maybe among them, you’ll find the right jacket for you! Hale is a short parka, made of 100% Polyester for the outer shell and Synthetic inner lining. It has a removable hood, adjustable with drawstrings. The collar on this jacket is high and is closed by the main zipper, as well as the snap button placket. There two oversized side pockets, with opening above and on the sides, as well as two chest pockets, these oversized, too. 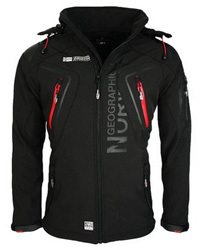 It is weatherproof, breathable and highly insulated, suitable for cold and wet conditions. The design is casual, so it makes a great daily jacket. The inner cuffs are made of ribbed elastic material and there are three color options: Blue, Navy and Black. 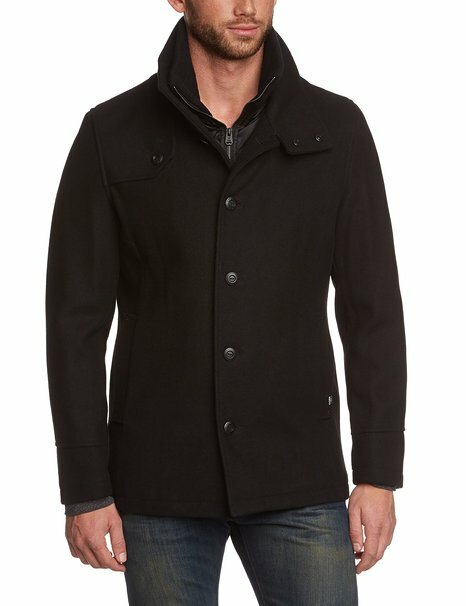 This very classy jacket, is made of 54% Wool, 36% Polyester and 10% other fibers. It is a long sleeve jacket, with a high stand-up collar, which comes hoodless. The inner layer zips up, while the outer part has a button closure, ending underneath the collar. This is a chic jacket, in a formal design, intended to transform the outfit from casual to stylish. It goes well with not just suits and formal clothing, but everyday shirts and blouses, too. The color it comes in is Black. Row Bomber is a down jacket, made for the winter weather. 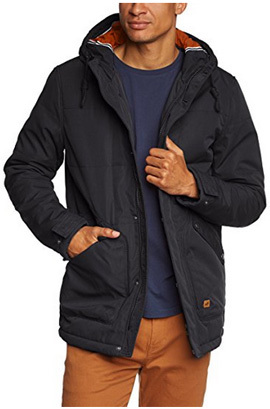 It is made of 91% Polyester and 9% Nylon, making the jacket weather-resistant, as well as highly insulated. The body, as well as sleeves are quilted, to evenly distribute the down filling. It is a short jacket, that comes with an attached hood. There are two hand-warmer pockets on the sides. 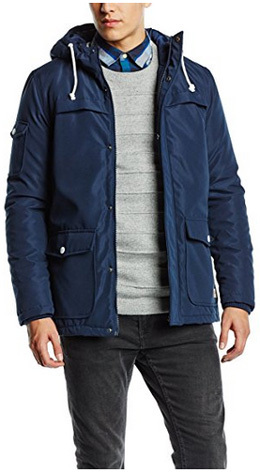 This is a slim fit jacket, in a casual design, which can be worn as a daily jacket, or even for work, because it has no logos or patches on the body. It comes in the color Dark navy. 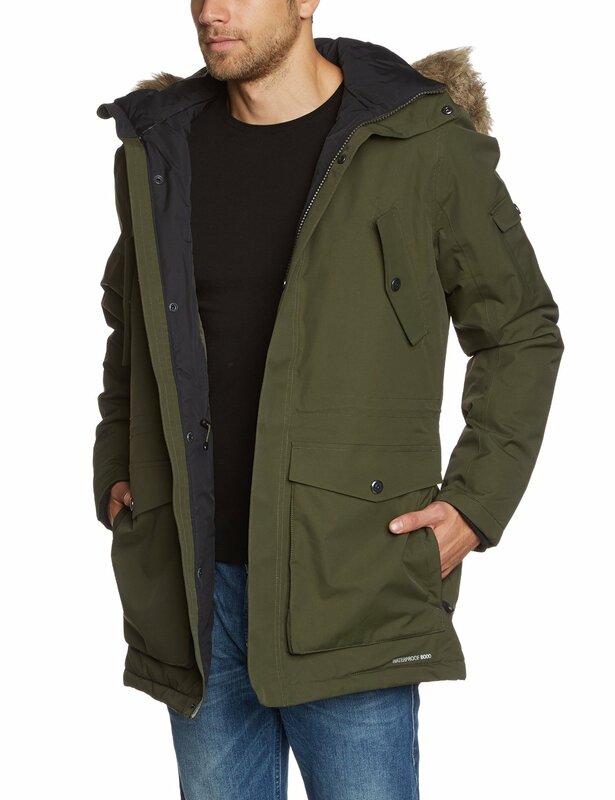 Jjmeyland III is a parka-style down jacket, that comes with a classic parka hood. It is made of 100% Polyester for the outer shell and inner insulating lining, while the filling is 80% Down and 20% Feathers. The hood is oversized and detachable, with faux fur trim around, to protect the face during cold drafts. 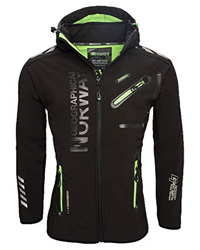 This is a water-repellent jacket, suitable for low temperatures and mildly damp conditions. There are two oversized side pockets, with dual opening, two chest pockets and one on the left sleeve. The inner cuffs are made of soft, ribbed material. This jacket comes in two different color combinations: Forest night and Navy blazer. Meyland is a parka jacket made of 100% Nylon for the outside and 100% Polyester for the inner lining, with a water column of 8.000mm. It has a removable hood, lined with detachable faux fur trim around. 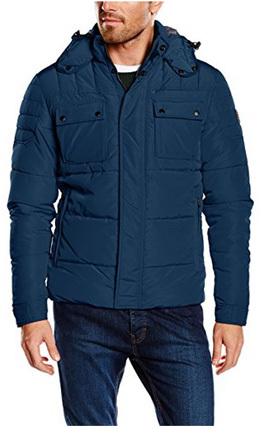 The inner cuffs are ribbed and warm, and the jacket is highly insulated and weather-resistant. There are two side pockets, two chest pockets, one sleeve pocket on the left side and two inner pockets. This is a casual jacket that can be adjusted for both loose and slim fit, with the drawstrings placed around the waist. There are five colors available: Black, Asphalt, Jester red, Forest night and Snorkel blue. The Jjcogary Puffer down jacket is for those who prefer the quality and warmth of a down jacket, without the having real down filling. 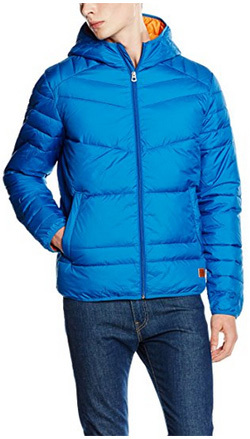 This jacket is made of 100% Polyester, both inside and out, including the quiled padding. It has a removable hood and elastic hem. This is a water-resistant jacket, thermally insulated and quite warm, designed for functionality, so it makes a great hiking or camping jacket. It comes in both regular and slim fit, with a waterproof zipper, covered by a snap button placket. There are two side pockets, two chest pockets, one sleeve pocket and one inner pocket. The colors available include: Blue wing teal, Navy blazer (in two fits) and Black. Harlan is a parka jacket, made of 100% Polyester, including the outer and inner lining, as well as padding, which is horizontally quilted. The hood is also quilted and lined for added warmth. There are two oversized pockets on the sides and small logos on the body. The cuffs can be adjusted with snap buttons, and the main zipper is waterproof and covered. 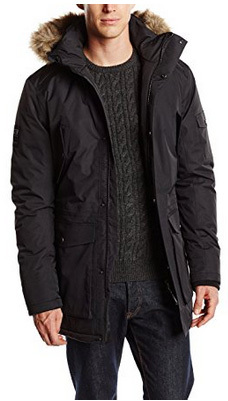 This jacket makes a great daily jacket, because it’s not just warm, but comfortable as well. It comes in the color Black. This chic jacket comes in a casual design and is made of 100% Polyester. It has an attached hood, adjustable with white fabric drawstrings. The pockets are all oversized, with plenty of storage space and are placed on the sides, chest and right sleeve, with snap button flaps on top, and zippers for the ones on the chest. 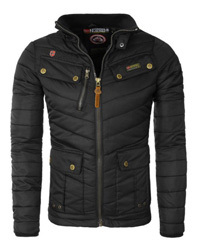 It is a short jacket, in a normal fit, designed for practicality and comfort. 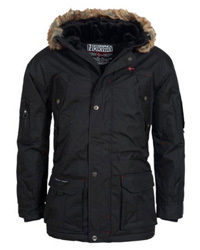 The material is water-resistant and windproof, making it a good winter jacket. Navy blazer is the color available for this jacket. 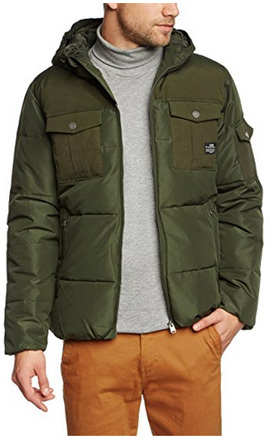 This jacket is called Wood Bomber and is made of 100% Polyester, with wide horizontal quilting. There are two side pockets, two on the chest and one on the upper left sleeve. There is an attached hood to the short collar, which adjusts with drawstrings. The cuffs are elastic and it’s a fully insulated jacket. The main zipper is weatherproof and uncovered. 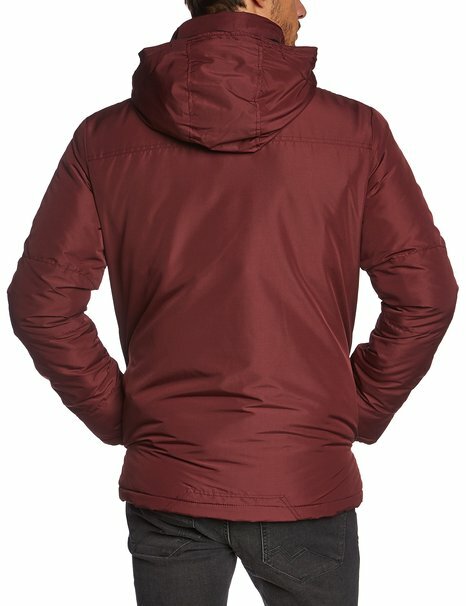 This jacket can be worn both as a daily jacket, or as a sports jacket for those who prefer jogging or hiking, as it is light and highly breathable. The colors available are two: Forest night and Black. Made of 100% Polyester and coming in beautiful, contrasting color combinations, this quilted jacket will fit right in with your style. It has an attached hood and a medium-height stand up collar, that closes up by the main zipper. The cuffs and hem are elastic and the stylish quilting design runs along the sleeves, as well. There are only two side pockets on this jacket. It is a casual jacket, which, due to the many colors available, will surely suit any outfit. The color selection includes: Blue, Navy blazer, Asphalt, Green, Red, Black, Navy and Classic blue.